Published on March 12, 2019 in Allenatori, Calcio, Generale, Mental coaching, Olimpiadi, Stress and Tennis. 0 Comments Tags: health, ISSP, mental disease, NBA, Silver. The NBA All-Star Isaiah Thomas once told him that “championships are won on the bus” with the players having greater camaraderie – and fewer headphones – but times have changed. Indeed one superstar had recently told Silver that from getting off a plane to a game to showing up in the arena he sometimes did not see a single person: ‘I am going to get to my room, stay in my room, get room service and go to the game Sunday,’” Silver said. “He knew if he said it publicly people would say ‘poor baby’. One study of 50 swimmers competing for positions in Canada’s Olympic and world championship teams, for instance, found that before competition, 68% of them “met the criteria for a major depressive episode”. Subsequent studies among Australian and French elite athletes have also shown that the prevalence of common mental disorders (CMDs) – such as stress, anxiety and depression– ranged from 17% to 45% of the athletes studied. Football is no different. A 2017 study of CMDs among 384 European professional football players found that 37% had symptoms of anxiety or depression at some point over a 12-month period. According to the researchers, a professional football team typically drawn from a squad of 25 players can “expect symptoms of CMD to occur among at least three players in one season”. So what should be done? Scientists writing recently in the International Society of Sport Psychology journal stressed that the need for athlete and coach education was paramount in removing stigmatisation around the issue and “to expeditiously help when mild subclinical issues are experienced before these issues become mental illness”. Some have gone public with their issues, including the Cleveland Cavaliers forward Kevin Love, who spoke about a panic attack he experienced on court. As he put it: “Growing up, you figure out really quickly how a boy is supposed to act. You learn what it takes to ‘be a man’. It’s like a playbook: Be strong. Don’t talk about your feelings. Get through it on your own. So for 29 years, I thought about mental health as someone else’s problem. It surely helps, too, that Silver is on the front foot and in his players’ corner, driving the debate on such an important issue. Other leaders world sports would be wise to follow his lead. Published on June 13, 2017 in Generale. 0 Comments Tags: Antonelli, Bouet, ISSP, José Maria Cagigal, Sevilla. Published on November 28, 2016 in Generale. 0 Comments Tags: Congresso, ISSP, Managing Council, psicologia dello sport, Seville, Siviglia, sport psychology, votare. The 14th World Congress of Sport Psychology will be held in Seville, capital of Andalusia in Spain, between July 10th and 14th, 2017. The central theme of the World Congress is “The integration of science and practice through multicultural bridges, gender and social equality”. International Society of Sport Psychology (ISSP) has invited 10 distinguished keynote speakers, who made an outstanding contribution in Sport and Exercise Psychology during extended period of time, to present and share their academic achievements in the congress. The deadline for abstract submission for the 14th World Congress of Sport Psychology is by 16 January 2017, and it is required to submit the abstract document via the Congress website. In past years, in order to vote the new ISSP Managing Council was sufficient to pay the two years together directly to the Congress registration , now this rule has been changed. To vote (also by post) we must now pay the membership fee of 2016 by the end of this year and the one of 2017 in the next year. Regardless of vote preferences, which have not yet been formalized, we must commit to inform about this new rule so that the largest number of participants can vote. I ask you to encourage members and friends to join right now the ISSP or regularize their position. All those who will not do so by 2016, will in fact be excluded from voting in 2017. Published on April 26, 2015 in Generale and Mental coaching. 0 Comments Tags: anniversario, Antonelli, ISSP, psicologia, sport. Published on April 18, 2015 in Generale and Libri. 0 Comments Tags: ferruccio antonelli, IJSP, ISSP, luigi pozzi. 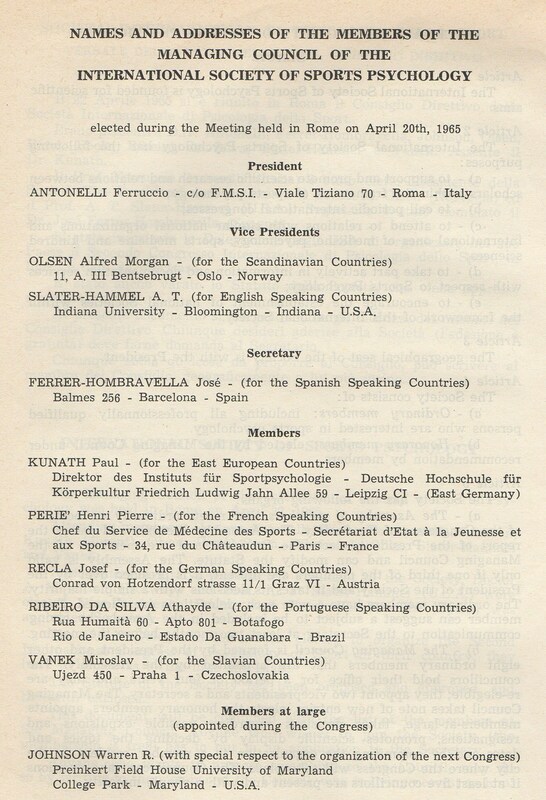 This year is also the 45° Anniversary of the International Journal of Sport Psychology founded in 1970 by Ferruccio Antonelli and published since that time in Roma by Edizioni Luigi Pozzi. Below his word to explain the reason to start this challenge at that time. 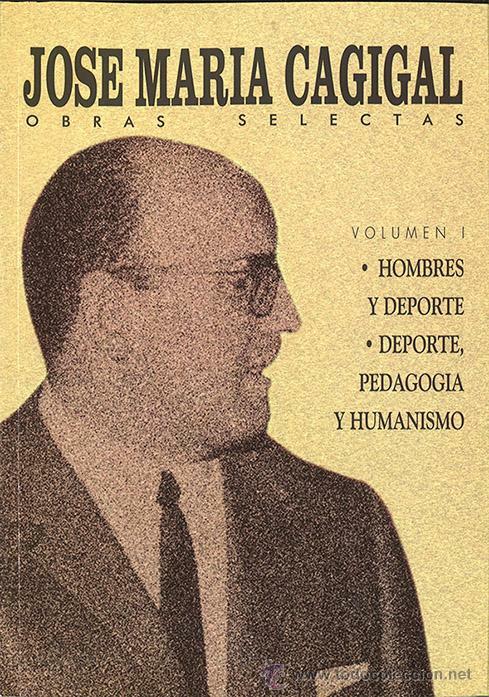 This journal was the very first dedicated specifically to sport psychology, and it was created almost 10 years before the Journal of Sport Psychology that was published for the first time only in 1979. “The Managing Council appointed an Editorial Board (led by Olsen), and I, too, signed a contract with a Norwegian publisher…and I received a good number of subscriptions. Because of the problems that Dr Olsen refers to, I have found myself obliged to take on the position of Chief Editor and to find another publisher at all costs and without delay in order to start the journal. A journal that would inform all members … had become a necessity, a duty.”(Antonelli, 1970, p.3-4). Antonelli found the person who would accept this challenge in his friend, the publisher Luigi Pozzi. Pozzi himself told me that when Antonelli proposed this enterprise just a few words were necessary to persuade him to accept. One can only agree with Salmela (1999), when he states that this was truly an heroic challenge, achieved only thanks to Antonelli’s solitary determination, without financial coverage. “For $10 a year I am able to offer only two small, unassuming, issues, so there is another matter which I must reveal. When registration to the ISSP was free of charge, I received 1500 applications. When I asked for 10 dollars, not for the ISSP, that sustains no expenses and thus requires no money, but for the subscription, only 10% paid this fee. I have found a very understanding publisher, who has agreed to give up all his profit, and for this I publicly thank him from the bottom of my heart; but printing and mailing expenses are enormous. I will be able to print and send out the first issue with what I have received to date. And I will send it to all 1500 members. If necessary, I will then go ahead at my own expense … this is not an exhibition of crazy heroism … I am sure that when they receive this first issue, many members will pay the subscription fee for the second issue of 1970” (Antonelli, 1970, p.4-5). Published on April 17, 2015 in Generale and Olimpiadi. 0 Comments Tags: ferruccio antonelli, fondazione, ISSP. Sunday begins the Congress which celebrates the 50th anniversary of the foundation in Rome of the International Society of Sport Psychology. Today few people remember that on Ferruccio Antonelli April 20, 1965 this organization was founded by Ferruccio Antonelli. Below the names of the first board of directors. Published on January 21, 2015 in Generale, Mental coaching and Stress. 0 Comments Tags: ferruccio antonelli, IJSP, ISSP, luigi pozzi, psicologia dello sport, Roma, sport psychology. Aula Magna of the Italian Olympic Committee, Rome, the 20th of April, 1965. That was the place and moment of the inception of the International Society of Sport Psychology – ISSP, by the hands of a small group of pioneers, led by the Italian psychiatrist Ferruccio Antonelli. This happened during the 1st International ISSP World Congress of Sport Psychology marking the Modern Era of our scientific field. From that moment professional and scientific networks were initiated, sport psychology was spread internationally, and the knowledge in this field was developed enormously. Continental societies appeared, with the North American Society of Sport and Physical Activity (NASSPA) and the European Federation of Sport Psychology (FEPSAC), being the first two. Concurrently, National societies began to be established, mainly in the European countries. 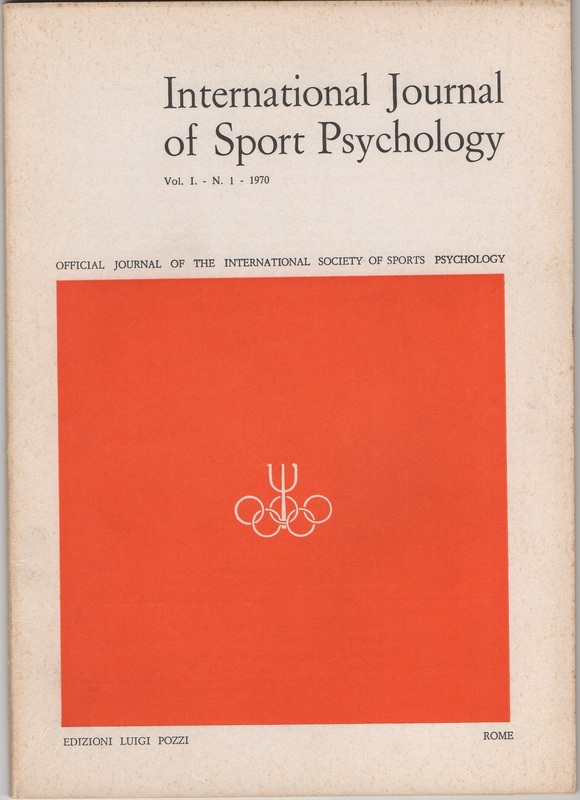 The International Journal of Sport Psychology, the very first scientific journal in the area and for many years the ISSP official publication, was founded by Antonelli and published by Luigi Pozzi Editors in Rome. Exactly fifty years after, this historical occasion will be celebrated in the very same place of the Italian Olympic Committee Centre, in Rome. For two days (April, 2015, 19-20), the ISSP 50th Anniversary Seminar will honor the past and all those who worked for the development of the Society. Celebrating the ISSP history is also an opportunity to look to the future. Hence, the motto of the event is “A Bridge from the Past to the Future”. The program of the ISSP 50th Anniversary Seminar will include invited keynote lectures, symposia and workshops, as well as submitted poster sessions. Reflections on the historical route will be done, namely during the Past-Presidents round-table, and the future will be symbolically represented by the lectures presented by the 2013 ISSP Developing Scholar Award winners. The 50th Anniversary Gala Banquet sponsored by Luigi Pozzi Editors will be the perfect moment for the social interaction among all the participants. Published on July 16, 2013 in Generale. 0 Comments Tags: Cina, Congresso, ISSP, Pechino, psicologia, sport. In few days will start the 13° World Congress of Sport Psychology in Beijing, around 1.000 participants will attend it. It’s the first time for Asia and probably for the next period the International Society of Sport Psychology will be lead by a Chinese president.